Israeli military raids in Gaza this month have left 1,100 Palestinians homeless, a United Nations agency says. About 130 homes have been razed in what the UN agency for Palestinian refugees says is one of the most intense periods of destruction for years. The group says Israel is meting out illegal collective punishment after the killing of a settler and her four daughters in Gaza a week ago. The Israeli army described the UN figures as highly exaggerated. A spokesman said the demolitions were not arbitrary, and were only carried out on buildings they knew to have been used by militants to attack Israeli targets. Israeli troops demolished 13 Palestinian houses on Monday - a day after gunmen ambushed Jewish settlers holding an outdoor memorial service for Gaza settler Tali Hatuel and her daughters. In all, the UN Relief and Works Agency for Palestine Refugees (UNRWA) said 131 homes had been demolished or wrecked beyond repair this month alone in army operations against militants who launch attacks inside Israel. It described the action as "one of the most intense periods of destruction" since the Palestinian intifada or uprising against Israel began in September 2000. UNRWA's commissioner general, Peter Hansen, issued a statement condemning the killings of the female settler and her four children, which correspondents say has provoked extreme tension in Gaza. But he went on to say that Palestinians as a whole in certain areas were suffering the reprisals in a form of collective punishment forbidden by international law. 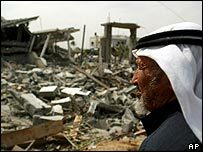 "The overwhelming majority of the more than 17,000 Palestinians who have lost their homes in Gaza since the start of the intifada [the uprising which began in September 2000] have been guilty of nothing more than being in the wrong place at the wrong time," he said. Israeli bulldozers flattened a row of homes along the road and a four-storey block of flats was blown up on Monday, leaving about 75 Palestinians homeless, reports said. "They left nothing for us," said one, a member of the Abu Hadaf clan which occupied most of the buildings. "The bulldozers are uprooting trees, demolishing our houses," he said. The Israeli army said the houses had been destroyed because gunmen had used them for cover. It came a day after gunmen ambushed some 300 Jewish settlers attending a heavily-guarded service on the Kissufim road near Gush Katif settlement for Tali Hatuel and her children. No Israelis were hurt in Sunday's ambush, but settlers were left crouching behind vehicles as shooting continued for 20 minutes. Mrs Hatuel was ambushed on 2 May on her way to Israel to lobby voters in a Likud party referendum on Prime Minister Ariel Sharon's plan to evacuate the settlements in Gaza. Islamic Jihad claimed responsibility for Sunday's attack. "Israeli bulldozers have been in action virtually every day"